This list will inspire you to start planning your next escape to the tropics. Visit some of the most unique islands around the world where you can spend your days snorkeling with tropical fish and discovering exotic food flavors at the beach bars and restaurants. 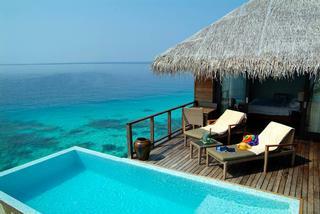 This hideaway makes you feel one with the ocean as you lounge in the sun surrounded by warm tropical waters. 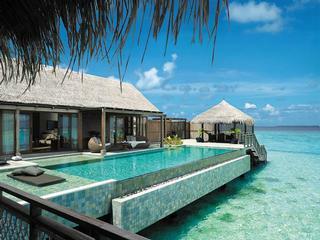 It's easy to jump in for a swim from the wooden dock and climb back up using the steps that lead up from the lagoon. This spectacular pool with circular edge is elevated above the ocean level to give you even better views of the surrounding coral reef and the ocean. Sink into one of the plush chairs and enjoy a drink with a view. 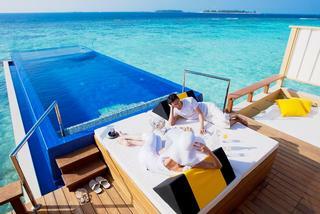 The long square private pool over the water at Angsana Velavaru in the Maldives is ideal for sunbathing and cooling off in the warm tropical sun. Next to it you will find two spacious daybeds for napping and relaxing. 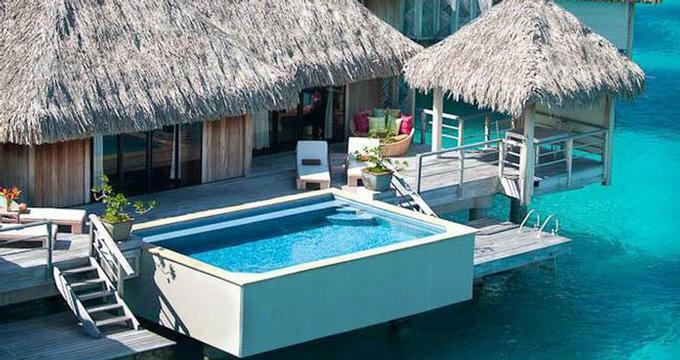 The two-story villa at the Hilton Bora Bora Nui in French Polynesia has two bathrooms with floor-to-ceiling windows and a refreshing pool in the center of the outdoor deck. 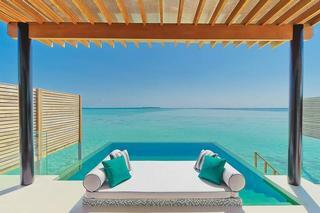 Pool meets the ocean at this scenic villa at the Anantara Dhigu Resort. If blue is your favorite color, you'll be able to admire its subtle tones. The word "wow" comes to mind when looking at this photo of the awesome island sunset at Lily Beach. 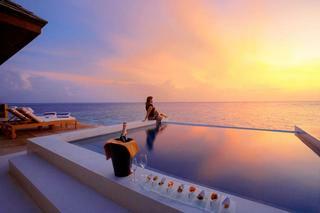 Have drinks as the sun sets into the ocean and the starts show up on the evening sky. This efficiently-designed bungalow has cozy lounge chairs and a pool that hangs over the edge of the deck just steps from the bed. The open-air design of the Anantara Kihavah Villas incorporates a deep tub and an infinity edge pool which offer magnificent views of the ocean. This spacious villa at Baros has a curved infinity edge pool over the clear blue water and a slick day bed with privacy curtains on the outdoor deck. 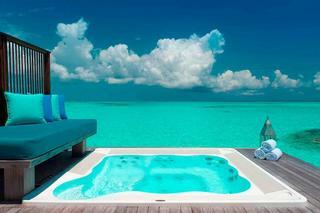 With a bright blue color matching the color of the ocean, the deck spa at the Conrad Maldives is perfect for stargazing at night. 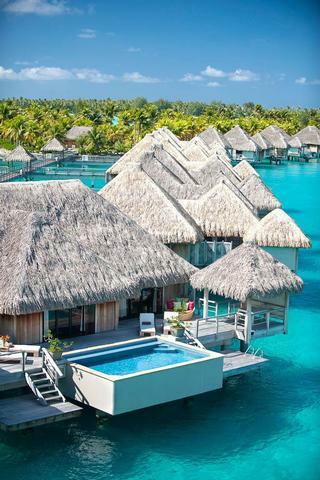 Huvafen Fushi Lagoon Bungalows were built on stilts over the lagoon to offer vacationers plenty of privacy and spectacular sunset views. 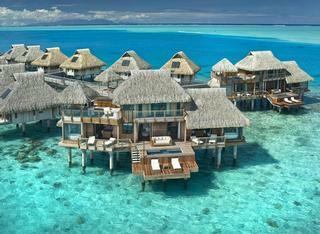 Accommodations at Le Meridien Bora Bora have modern looking pools with a vanishing edge on the private outdoor decks. 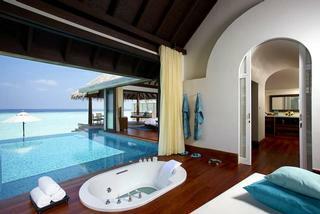 Sweeping ocean views at Niyama create the perfect backdrop for a honeymoon in the tropics. 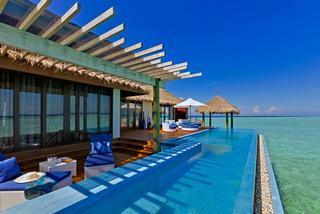 Ask for Villa Muthee Deck at Shangri-La Villingili for a picture-perfect honeymoon. 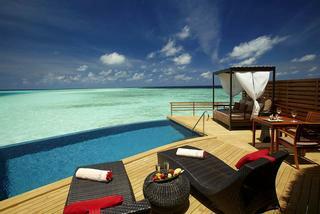 The villa has a spacious deck perfect for sunbathing. 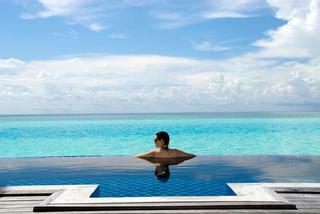 Velassaru offers one of the largest private pools over the water in the Maldives. 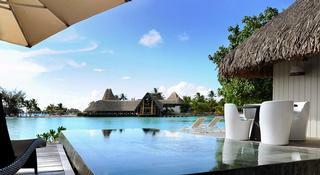 It spans two distinct relaxation areas with great ocean views. 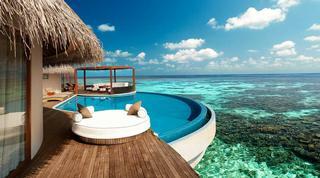 Next Read: 12 Best Tropical Vacations with Scenic Pools.